Scooper - Technology News: Have we reached 'peak' well-being? Have we reached 'peak' well-being? We all want our children to have better lives. This is what made life today better than ever before in human history. On average, we are wealthier, have better access to healthcare, are more secure and have more control over our lives. While there are many reasons for optimism, there are also signs that we may be at a turning point, that we may be the generation to see well-being peak. Rising income inequality, societal polarization, continued environmental devastation and mounting economic risks have been eating into living standards and may make life for future generations in many countries more difficult. In the United Kingdom , the millennials may be the first generation to earn less than their parents. Leaving a better future to the next generations requires long-term thinking, but recent years have given way to a relentless immediacy of pressures as information spreads faster and emotions dominate political debates. Short-termism, driven by a need for quick returns in political support or economic outcomes, is constraining the policy space for long-term measures. How can countries better prepare for a future that is characterized by accelerating trends and proliferating systemic risks? They not only have to address the latter – they need, in parallel, to leverage fundamental shifts currently under way, the most important of which is arguably the technological change brought about by the Fourth Industrial Revolution. Moreover, this is our responsibility to guarantee that today’s choices, decisions and actions do not compromise those of tomorrow. As a result, the policy mixture will span very diverse areas and be different depending on what a country wishes for its future generations. Yet some core elements stand out. Economic planning, investment in youth, health and human capital, embracing change and innovation, protecting the environment, creating a stable society, as well as upgrading infrastructure and keeping up with technological change, come to mind. Yet an institutional environment that supports long-term thinking and a cohesive vision is also important. Contributing to this important debate about what makes countries equipped for the long-term, the World Economic Forum presents a conceptual framework to measure the future preparedness of countries, understood as the well-being of young and future generations. The framework is based on the approach that in order to increase future well-being and benefits from the uncertainties of the future, countries need to be able to leverage trends and build resilience to risks. To help countries on their journey, the framework intends to offer a tool to policy-makers and society at large to benchmark their own future preparedness with that of peer countries. The framework is built around four main dimensions - Fourth-Industrial-Revolution readiness, economic readiness, security and social cohesion - that encompass nine categories (see the chart below). Each category is composed of forward-looking indicators that aim to signal long-term trajectories, rather than focusing on current status. We don’t plan to rank countries on their overall future preparedness as we want to avoid making any predictive judgements on specific future strategies. Instead, countries will be able to benchmark themselves on individual dimensions and categories. To ensure that the next generations enjoy a level of well-being as high as ours, all sections of society have to change their mindsets and start thinking long term. But this is easier said than done. The Forum’s future-preparedness framework offers a new benchmarking tool to help leaders prepare for the future disruptions that will be created by long-term challenges, and to seize the opportunities presented by long-term trends. Time is running out. The future of our children and grandchildren depends on us embracing these opportunities and building a resilient society. 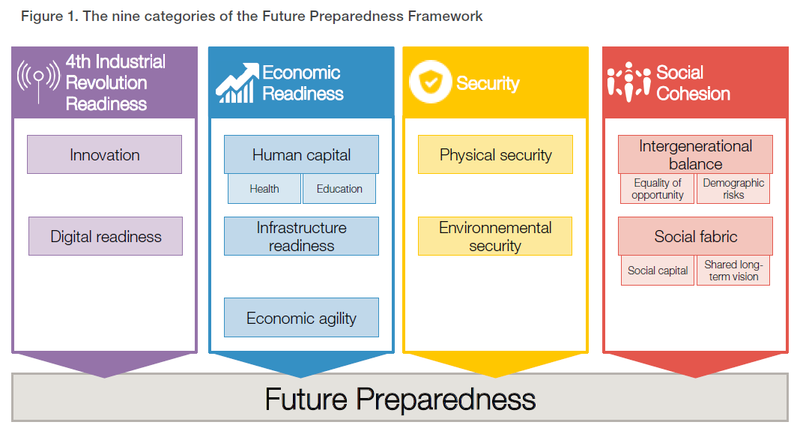 You can read the whitepaper, Future Preparedness: A Conceptual Framework for Measuring Country Performance , here.